At least 1 hour in advance, clean and slice the mushroom very thinly. 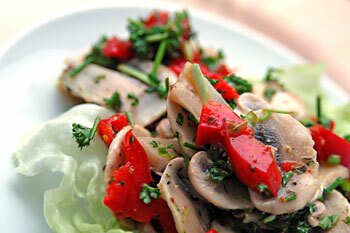 Place sliced mushrooms in a large bowl; toss with lemon juice, chives, parsley, and tarragon. Meanwhile, in another bowl, combine Italian seasonings, olive oil, juice from the red pepper, sugar, and mustard; whisk together. Add the sweet bell pepper pieces. To serve, toss mushrooms with the salad dressing mixture; arrange on mixed salad greens on a serving platter or individual salad plates. Posted by Chris Walker on February 26, 2007 in Bell Pepper, Mushrooms, Salads.